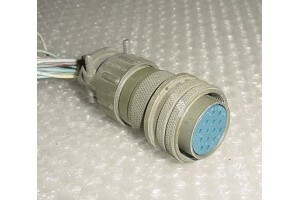 Aircraft Amphenol Cannon Plug Connector. P/N MS3106A20-27S. Aircraft Amphenol Cannon Plug Connector. P/N MS3106A20-27S. NSN: 5935-00-257-9663. AN3057-12 Connector plug is also included. Plug is used on Cessna / ARC IN-525A Glideslope Indicator, P/N 32350-0001 as well as other avionics. It is in good condition.